Items 169- out of displayed. 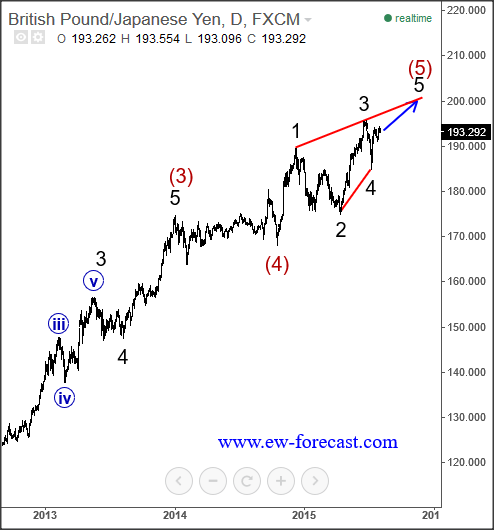 GBPJPY has been bullish for the last three years, we see an impulsive structure unfolding. Impulse is a five wave move and when this is completed we can expect a three wave retracement. 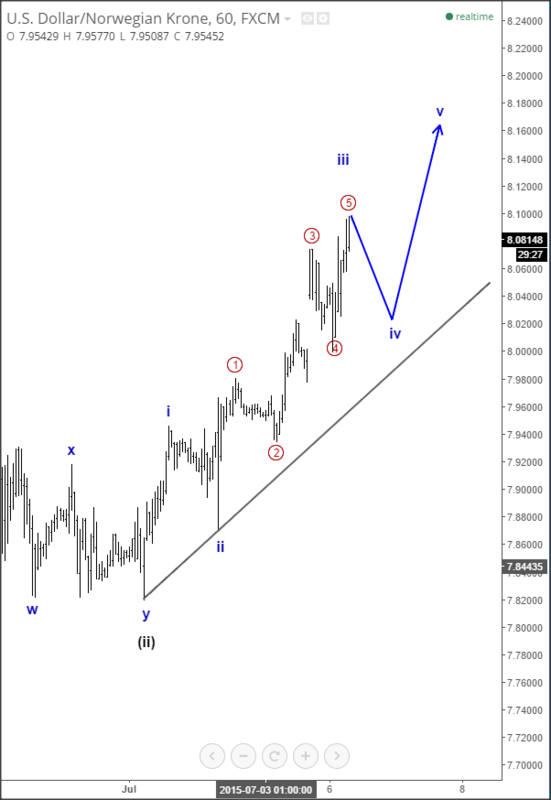 In our case that means big three waves to the downside on GBPJPY. However at the moment we see final leg in this impulsive sequence unfolding. We are tracking red wave (5) that can be an ending diagonal with a new high coming to around 197. 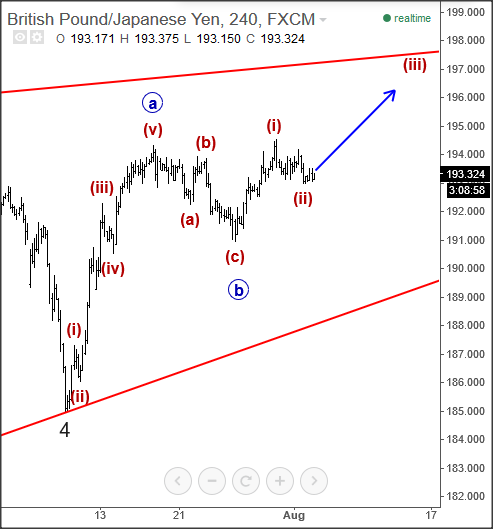 On the intraday chart we see a three wave setback that can be looking for a support near 192.50-193.00. Idealy market will turn up from this region while invalidation level 191.00 must hold. Intraday Morning Updates in Video format. 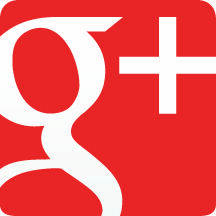 Please click below for our view on EURUSD, USDJPY, DAX and S&P500. 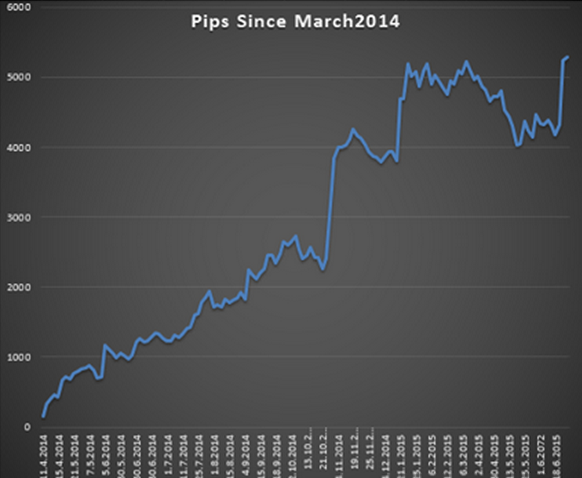 My Swing trades since March 2014. Everything was shared with our members. USDNOK has been trading in impulsive fashion the last couple of days, reaching new highs after the correction in previous black wave (ii). 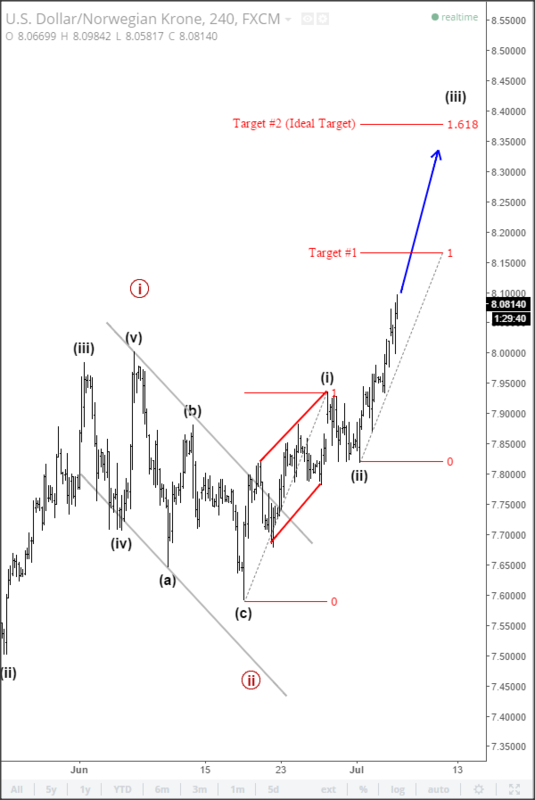 We assume that USDNOK will continue to the upside to Target level #1 to around 8.15-8.17 where third leg would equal to the first leg of black wave (i). 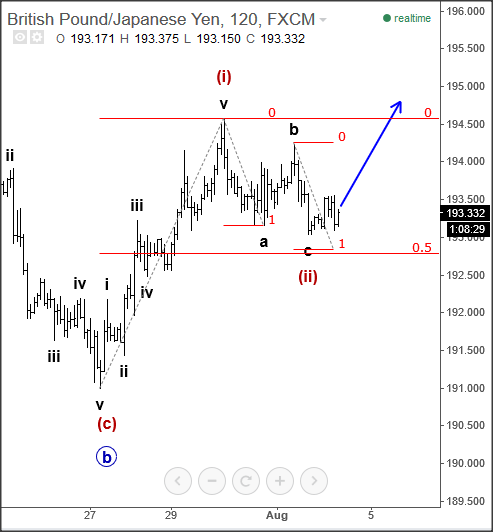 But ideally we will see an extensions up to 161.8% (ideal target) for black wave (iii). We see price trading above the trendline support shown on the hourly chart which is important evidence for bullish trend. So as long as this line is not breached we will continue to look higher within a black wave three. 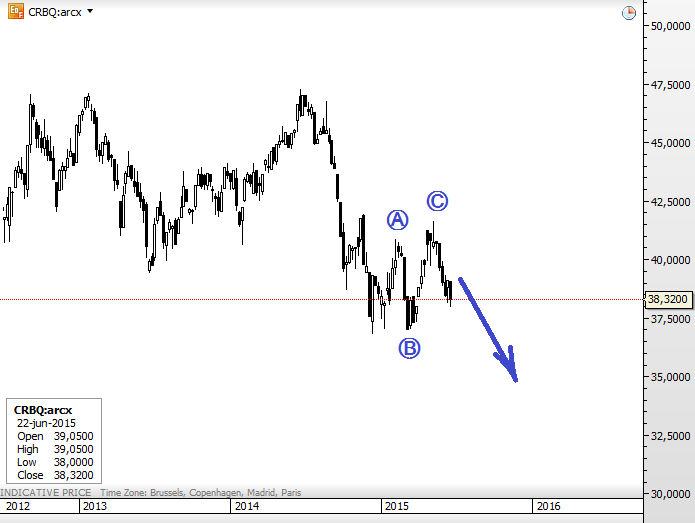 One of the reasons why USD can gain more and why commodities and commodity currencies will stay under pressure is on *Thomson Reuters Commodity Index (CRB) where I see a completed three wave rise; a corrective move that is pointing for more weakness in weeks ahead. *The Jefferies | TR/J CRB Global Commodity Equity Index measures the performance of equity securities of a global universe of listed companies engaged in the production and distribution of commodities and commodity-related products and services in the agriculture, base/industrial metals, energy and precious metals sectors. 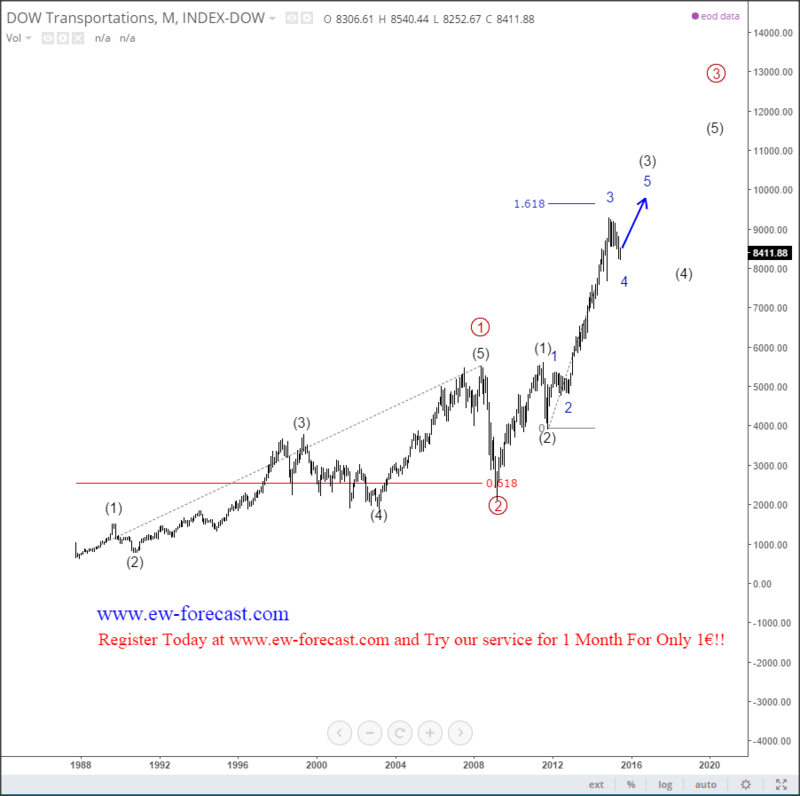 On the weekly chart of DOW Transportations index we can see that market has been trading bullish since the star of 2012. It has already made four waves up, with blue wave 4 in final stages. On the Daily chart we see that price made a new leg down in blue wave (c), thus completing the correction in red wave y of blue wave 4. But still Blue wave (c) may continue to the downside, if we include the possibility of ending diagonal in blue wave (c). Nonetheless price may turn higher in weeks ahead. When market will reach a new high with blue wave 5 we will be looking for a larger corrective retracement, probably later this year. Register Today and Try our service for 1 Month For Only 1€!! In the next video I will update you with my long-term view on some major global indicies. If your remember back in October of 2014, we talked about more upside on stocks which was correct as just few months later DAX rallied around 40%!! But now this leg can be near completion, so we think it's an important time for a possible new major swing in weeks and months ahead. In the following video I explain why USD could rally and EUR decline by looking at DAX, German Bunds and USD Index.